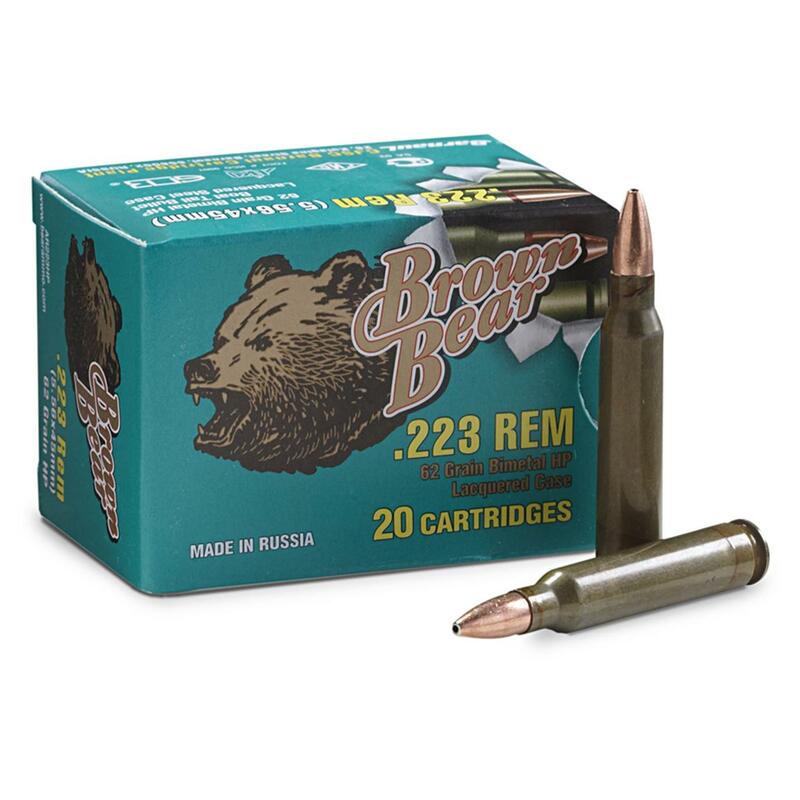 Brown Bear® .223 62 Grain HP Ammo, PRICED LOW! Hot shots for your .223 caliber at bargain prices! Steel case. Non-corrosive, non-reloadable, Berdan-primed. 62-grain hollow point bullet. Reliable current production. Muzzle Velocity: 3,050 F.P.S. Muzzle Energy: 1,281 ft.-lbs. Get this roarin' good deal right now! 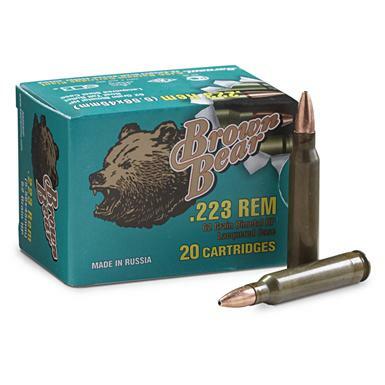 Brown Bear, .223, HP, 62 Grain, 240 Rounds is rated 4.5 out of 5 by 8. Rated 3 out of 5 by texx from Great price Solid ammo for plinking. Rated 4 out of 5 by Jimbo from A very good price. Fired a few rounds, no problem with the feed or ejection. Rated 5 out of 5 by bender from Good price and product Bought this for gifts and self. No problem shooting and a good price. 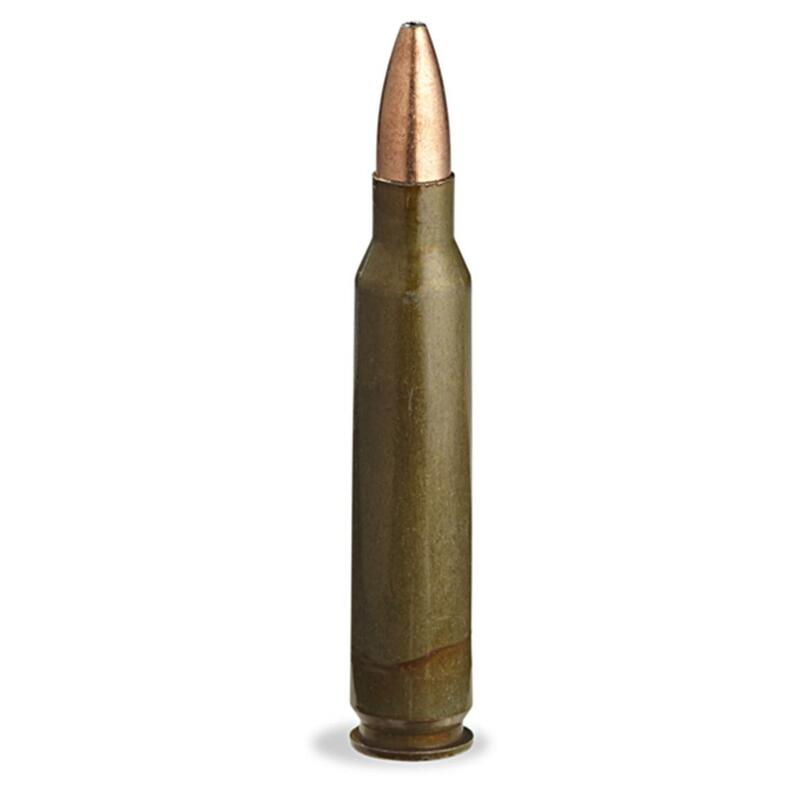 Rated 4 out of 5 by Chuck from good value, good ammo for target/plinking, ease of ordering, variety available I've shot quite a few rounds of the Brown Bear ammo thru several guns and never experienced a problem...reliable, chambers well, comparatively cheap...all around good value. Rated 5 out of 5 by KaiHerrmann from Great deal! So far, so good, no FTF or FTE. Rated 5 out of 5 by WILLIAM L from You absolutely cannot beat this price! Rated 5 out of 5 by ALEC from Brown Bear is always reliable if a little smelly.